Father Wand is welcomed by Ken Goodman, Treasurer and church wardens Ernestine Franz and Helen Dunlap. He lives in Phoenixville and also volunteers as a counselor in Chester County for APPRISE, to advise Medicare beneficiaries and VITA, by assisting the poor with filing tax returns. Father Wand’s wife, the Rev. 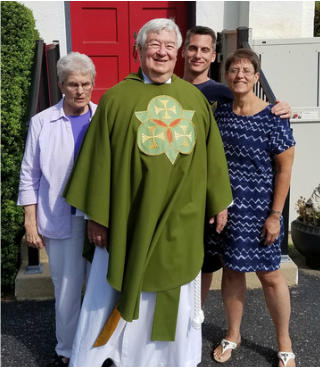 Marlene Haines is also a priest, who recently retired from an outreach program at the Church of St. Luke and the Epiphany in Center City, Philadelphia, for those affected by HIV/AIDS, as well as their family and friends. They have two children; David, an attorney in New Jersey with a practice in environmental law, and their daughter, Kate, who is teaching in a school near Shanghai, China. The school is affiliated with the United World College organization.